Not sure how they got the high ratings. Probably 1/4 of sites are too slanted for A or C RVs. Lots of traffic noise. Shower stalls are really clean but really tiny. If you don't have a car, not much to do. WOW! What a great campground. Small with only 30+ sites. The staff is amazing and willing to do whatever to make your stay great. Facilities are meticulouosly maintained. Pool and hot tub were awesome. Perfect location: out of the busy Gatlenberg/Pigeon Ford areas, but close enough to everyting (less than 10 minute drive). Driving or walking to explore the mountains is a must and this camp area is perfectly situated to do it all. We spent 6 nights there with 5 families (11 kids from 5-14) and will definitely be back for more! The only negative (if you can even call it that) is the dog run is very tiny. However, we really cant say enough good things about this place! If you like campgrounds that are quiet, smaller, clean, with cute, well-maintained grounds this place is for you. It's a little east or Gatlinburg and backs to the woods. All you hear are birds and occasional car swooshing by. The employees/owners are very friendly. No streaming on the wifi, but that was fine for us. A bit away from Gatlinburg. I was given wrong directions based on my direction of travel. Site was not level and approach difficult. WiFi inop at my distance from signal. Hot tub inop. Some road noise during the day that goes away at night. This campground is a wonderful gem. I am so glad I found it. The staff were extremely helpful when I had an issue with my new 5th Wheel, they offered their assistance and we were able to fix the problem. The pull-through sites are paved, and well maintained. We had to leave one day earlier than scheduled, but we will definitely be back. On the site now making reservations for Columbus Day weekend. We made our third trip here last week with our grand daughter. 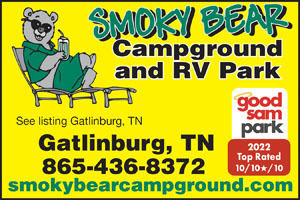 We absolutely LOVE Smoky Bear Campground. The staff is excellent, the grounds and facilities immaculate and best of all it is out of town, quiet and peaceful. After a long day in bustling Gatlinburg it is an oasis of relaxation. Although we are not hikers, we have seen many others getting advise from the staff on where to go in the Smokys Nat'l Park. They are really knowledgeable about the area and the best places to go and see. 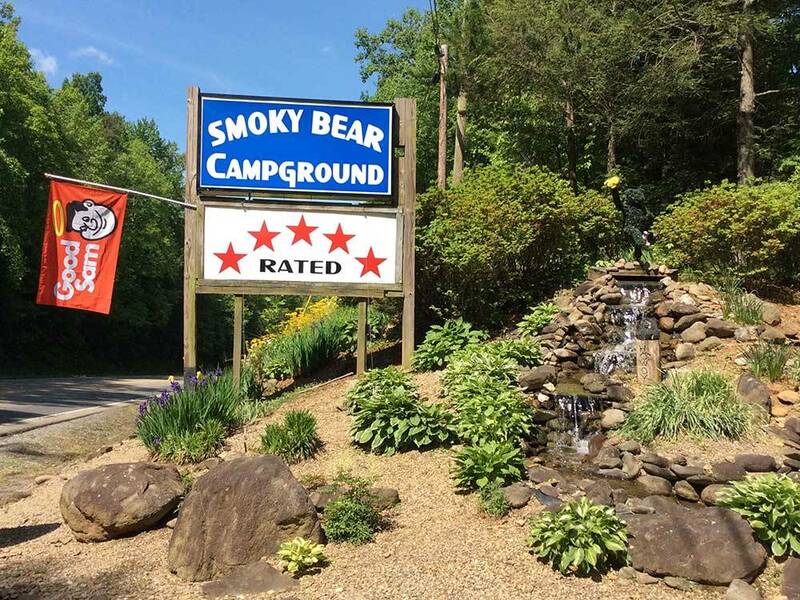 We highly recommend Smoky Bear Campground to anyone visiting the area. I found the park to be excellent. Blacktop roads, concrete pads, easy in and out access, very clean, owners are very friendly. The only negative is that is a little far away from all the Gatlinburg / Pigeon Forge activities. Still one of the nicest parks I have ever been in. The wife and I had a very good experience with this campground. It is very organized and clean. The owners are very nice and if you need something they will try to provide it. If you are going to the Smoky Mountain's National park this is the place to stay. Hope to go back in the next couple years.